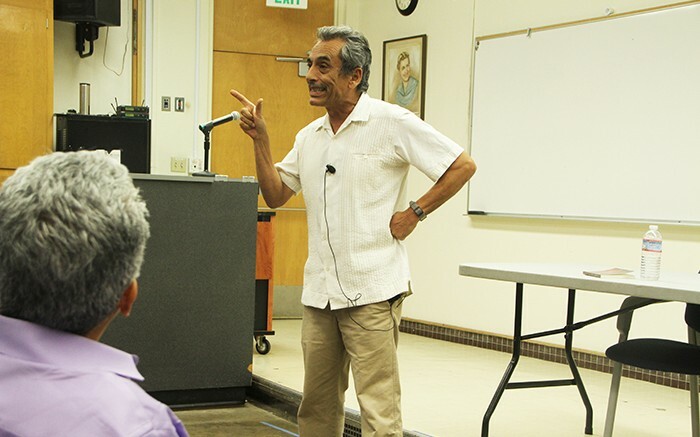 Poet Alejandro Murguia, who is the 2012 poet laureate of San Francisco, recites poetry from memory at the college hour event Creative Connections on Thursday. Writer Anel Flores also did a reading at the event (Photos by Noor Abasi). Latino culture, including the celebration of the Day of the Dead, is being appropriated, according to two writers who spoke at the Creative Connections college hour event at American River College on Thursday. “It is something that is spiritual and authentic, and we should keep it spiritual and authentic,” said Murguia. Anel Flores, the author of “Empanada: A Lesbiana Story en Probaditas,” told the audience that her grandmother served as an influence on her storytelling. Flores said that her grandmother had to run from one mountain to another to help her great-grandmother deliver a baby, but the child died before she arrived. Flores said her grandmother didn’t have the freedoms the men around her did. Flores said her writings stem from world history, that she attempts to give a voice to the voiceless and that there are still many stories that are not being told. Flores said that she was kicked out of her household when she told her family that she is gay. Flores said that when giving a reading of her work via Skype, a student came out after she told that story. Murguia said that he has often been “accused of being a poet” before he recited his poetry. He believes that it is important to have poetry remembered and recited from memory. Attendee Loras Ojeda said Murguia brought him to tears, in spite of having heard him read his poetry before. Be the first to comment on "Published writers describe how Latino culture influenced their poetry"